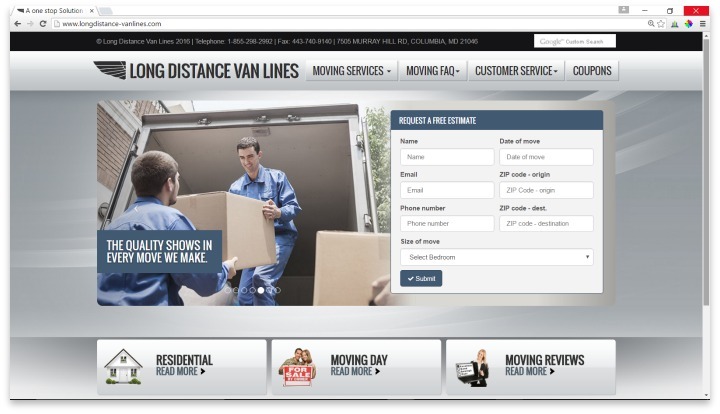 Long Distance Van Lines is a moving company that was founded in 2005, and is headquartered in Baltimore. Their moving services are available for residential clients who are making a move to another state. Long Distance Van Lines also offers specialty item moving services, such as artwork or piano moving. All items are stored in secure, climate-controlled spaces while in transit, and they offer flexible scheduling to work with your needs while you move. Long Distance Van Lines is another moving company that focuses only on helping customers move their homes within the United States. Their services are designed for long moves, and they offer temporary storage in a climate-controlled warehouse until the delivery date. They do have the ability to properly move, store, and deliver pianos, antiques, and artwork, and they can also work with you if you have business items that need moving. Like many other long-distance moving companies, Long Distance Van Lines does not use the same moving team for both pickup and delivery, and they do rely on third-party movers to perform the services. This means that every experience with Long Distance Van Lines could differ from the reviews that users leave, and it makes it difficult for the company to guarantee a certain level of quality in their services. Online reviews for Long Distance Van Lines sit squarely in the middle, with the most commonly cited issue being that of the estimation and price procedure. Unlike many other movers, Long Distance Van Lines gives their only estimate over the phone, rather than coming to your house for a final walk through. This means that the estimate that most customers received was far below the final cost. Additionally, there is an overwhelming number of reviews that claim that Long Distance Van Lines demanded more money from them before delivery would be completed, even beyond $10,000 in some cases. As with many other moving companies, the deposit that is paid before moving begins is non-refundable, and Long Distance Van Lines seems to charge a deposit around $1,500 on average. While most reviews indicate that care was taken with items, those that do mention damaged goods also reveal that Long Distance Van Lines’ insurance for items is pennies on the pound, meaning that a lightweight but valuable item could never be replaced at its proper value. Customer service receives a fair review, with even overall bad reviews revealing that their contact with the company was constant and easy to understand. Long Distance Van Lines services are designed for long moves, and they offer temporary storage in a climate-controlled warehouse until the delivery date. At the end of the day, most of the complaints for Long Distance Van Lines stem from their pricing tactics. If price is not as big of a concern, or you are prepared for a very high price in exchange for expert handling of specialty goods, then Long Distance Van Lines may very well be for you. Their services are generally reviewed as courteous, on time, and careful, which are three things that many competitor moving companies struggle with. If you must use a moving company, particularly for expensive special items like pianos or large art work, Long Distance Van Lines would be a good option. Just be sure to have extra budget available before it’s all said and done. Have you had an experience with this company? Please share your Long Distance Van Lines reviews below.